Olive Garden Chicken Gnocchi soup is one of the most popular Olive Garden soup recipes. It is a rich soup that can be made into a meal. This warm bowl of goodness features roasted chicken, potato gnocchi, carrots, celery, and spinach. Soup warms the soul, and this is no exception. Enjoy this favorite soup, it’s the perfect weeknight meal. When you put out these bowls, they are going to come back empty. 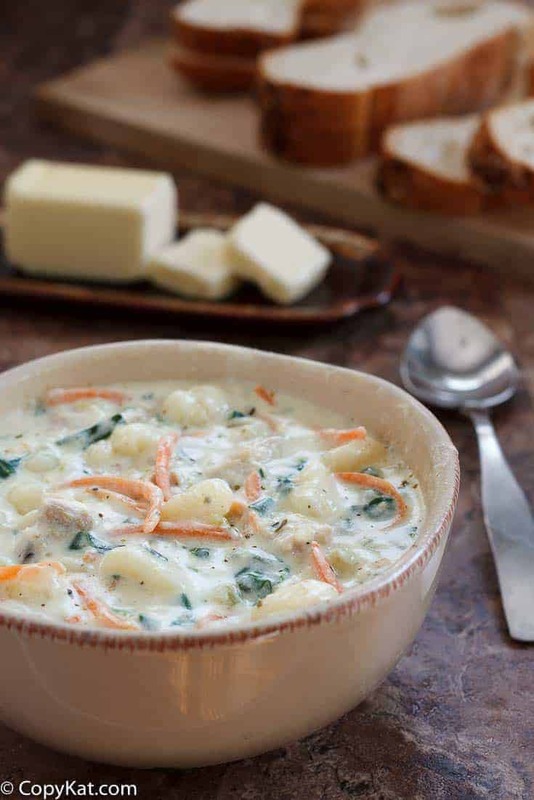 The Chicken and Gnocchi soup is going to taste like you spent hours at the stove making your family a delightful chicken and potato gnocchi soup. You can find the gnocchi in a couple of different places in your supermarket; my local stores sell shelf-stable potato gnocchi in the pasta isles. In higher-end grocery stores, I have seen this sold in the fresh sections where you would pick up a prepared meal, I have even found it available in the frozen section of the grocery store as well. Either type of gnocchi will work well. Your family will really love this. Have a hard time finding gnocchi? Make your own homemade potato gnocchi. Hands down this has been one of my most popular recipes at CopyKat.com. You can read through the comments and you can see how many people just love this soup. It is easy to make and it tastes great. Actually all of my Olive Garden Recipes are pretty popular. Most people seem to just love the Olive Garden menu items. A lot of people ask me if you can freeze this soup? Yes, you can. So go ahead and make up a batch of this soup, and store the extra in your freezer. You will soon fall in love with this delicious soup. Don’t forget to make some salad and bread sticks to go with this classic dish from the Olive Garden. It is very simple to make the Olive Garden Chicken Gnocchi soup, you will find that all of the ingredients are very common in your average grocery store. This recipe begins sauteing the vegetables in butter, and then you add some flour and cook that through. You will then add in the half-and-half and chicken broth. Cooked chicken and gnocchi gets added to your seasoned broth and vegetables. You can then adjust your seasoning and you will be ready to serve this soup in about an hour. Yes, you can freeze this soup. The soup stays well in the freezer for a couple of months when stored in an air-tight container. Can you use a crockpot for this recipe? Yes, you can. I personally like to saute the vegetables first before I prepare the soup. You don’t need to do that if you like. Simply place all of the vegetables with the exception of the kale, chicken, seasonings, and stock into the crockpot. Cook on low for 4 hours. Shread the chicken, add in the remaining ingredients and cook for another hour. If the soup is too thin for you, make a cornstarch slurry 1 tablespoon of cornstarch mixed with 2 tablespoons of water. Stir the cornstarch slurry into the soup, and turn the crockpot on high and stir until the soup has thickened. Do you love Olive Garden Recipes? Melt the butter into the oil in a large saucepan over medium heat. Add the onion, celery, and garlic and cook, stirring occasionally until the onion becomes translucent. Whisk in the flour and cook for about 1 minute. Whisk in the half-and-half. Simmer until thickened. Whisk in the chicken broth. Simmer until thickened again. Stir in 1/2 teaspoon salt, the thyme, parsley, nutmeg (if using), carrots, spinach, chicken, and gnocchi. Simmer until the soup is heated through. Before serving, season with additional salt, if necessary. omg better than the OG version thanks so much look forward to all your suggestions. I am glad you enjoyed the soup. I don’t have half and half. I have Table Cream, 2% milk, and Mocha Mix. Will any of these work? I would use table cream, and if the soup is too rich, I would add more chicken stock. If you only have 8 servings then they would be about 1577 calories per serving based on calories of all ingredients for 8 servings. Not sure if the # of servings accurate as listed. The nutritional information is calories per serving. Yes, the nutritional info does give calories per serving; however it omits the amount per serving. Usually recipes will indicate how many servings and the amount per serving. So will I consume 1577 calories in one cup of soup or two? I really appreciate your comment, and I need to discuss with the software author that it doesn’t allow me to write in the portion amount. So the pot of soup is say 10 servings. So that means the soup is 10 equal servings, and the calories divide out among the 10 servings. I am sorry this doesn’t give me a spot to put this in. This is great soup, I make my own gnocchi, it’s really easy and takes hardly anytime. So, I would not buy the gnocchi. After the potatoes are boiled off, just smash them down, add flour and salt and pepper, roll them out and cut, I just throw them in with the already cooking soup, you do not have to boil them separately. A FRIEND OF MINE USED A CROCK POT.CAN U USE A CROCK POT FOR THIS SOUP ? I think you could but I would saute the vegetables first, I wouldn’t add the gnocchi until maybe an hour before serving it. You are amazing . please can you. Make a SWISSROL CAKE. with no crack please. Please . nobody made it without crack and moist . Well I think if you put the seam side down, the crack would not show on that Swiss roll. I will keep your suggestion in mind! That is downright brilliant. I will have to give that a try! My son try this soup when traveling in USA, we don’t have Olive Garden in Toronto… so I try your recipe, we have repeated it a lot of times, always enjoyed . Made it in special ocasions when friends are coming …Wow! People were always so pleased. Thank you! Do you use ground thyme or thyme leaves ?? I have use thyme leaves. I didn’t precook the gnocchi and it made the soup too thick. The gnocchi sucked all the moisture out of the soup. I love it excepy mine came out a little bland. Should I up the garlic or the salt? Please give suggestions! I meant to say except. Mine did as well! I’m not sure what to add but its definitely missing something to make it taste just like Olive Garden. I found that if I amp up the flavor of the chicken it takes away that blandness. I used chicken bullion powder to add a kick to the chicken. I also recommend to ease up in the thyme. 1/2 tsp is super powerful. Yes! Adding chicken bullion was exactly what it needed. I think my chicken broth wasn’t strong enough. Chicken stock would have been better, At first it was still too milky tasting and we added a little oregano and some garlic powder trying t fix that, but it was still missing something.Adding the chicken bullion was what really gave it the flavor it was missing! My wife and I have made this soup many times. We do not use store brand stock. We make our own by boiling the chicken with onion, celery, onion and garlic powders etc…also we precook the gnocchi. That homemade chicken stock can really add alot of flavor. Hi Stephanie, reading the comme ts I read that you should boil the Gnocchi before adding to the soup. Then I thought I read another comment that you don’t have to ptrcook the Gnocchi. Which one is it? Love your recipe. Thank you. I don’t think you need to pre-cook the gnocchi per se. You can add it to the soup but you will need to cook the soup for long enough to cook the gnocchi. I precook it. It makes for a thinner soup. Also you can add more stock if you don’t preccok the gnocchi to compensate, however I don’t know the amount you would need to add sorry.